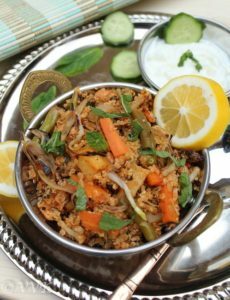 This is a traditional Tamil Nadu Style Vegetable Dum Biryani. The interesting twist here is that rice is replaced with quinoa. 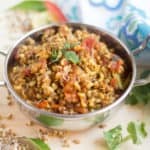 So here is a fiber rich, protein filled and nutritious quinoa biryani making it perfect for everyone. The quinoa and the vegetables are cooked separately and layered together and steamed again on low flame / Dum to enhance the aromatic flavors. This is my second biriyani recipe in this BM. The first one was Dindigul Biryani. There are many theories about the origin of Biryani and also about the name reason. I didn’t want to get into that. 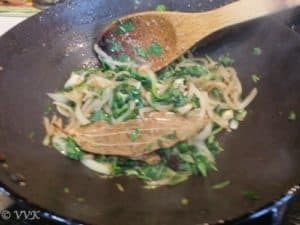 I just wanted to thank whoever found this recipe. That’s all. 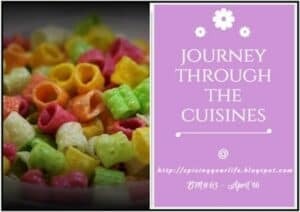 Each and every region has their own distinct recipes and all are unique and great. 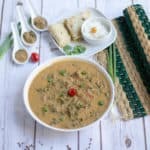 It is a complete meal by itself and all it needs is a simple onion raita as a side. The unique ingredients here are the rose syrup/essence and saffron strands. It adds the refreshing flavor to the biryani. 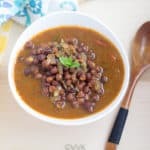 You can try this with basmati rice or Seeraga samba rice instead of quinoa. 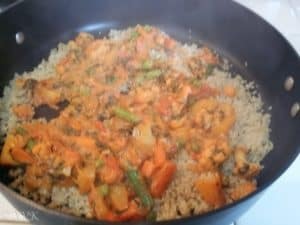 I used 1 potato, 1 carrot, 5 to 6 string beans, 1/4 cup of peas and 1/2 cup of cauliflower florets. 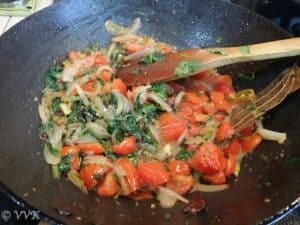 Chop all the veggies and tomatoes and set them aside. 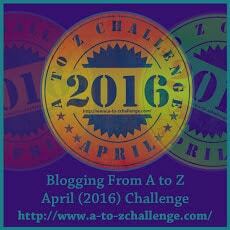 Slit the green chillies into two. Thinly slice the onions and set aside about 1/4 cup for adding later. Soak the saffron strands in 1/4 cup of water. Soak the quinoa in water for half an hour and wash it twice or thrice to make the dust and other husks washed away. Heat 3 cups of water with 1 tsp of salt and 1 tsp of oil. 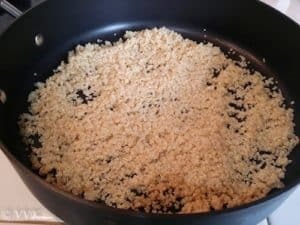 Once the water is warm, add the washed quinoa and let it cook. Once it starts to form bubbles, cover and cook till the quinoa is done. Drain the water and spread the cooked quinoa in a plate and let it cool. Heat the kadai and add ghee. Meanwhile crush the cardamom, cloves and cinnamon and stone flower coarsely. 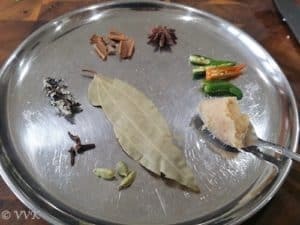 Once the ghee is hot, add the bay leaf, star anise, crushed cardamom, cloves, cinnamon and slit green chillies. 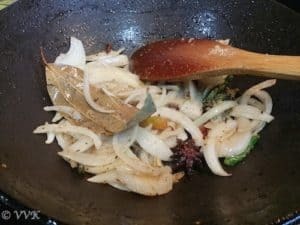 Fry for a minute and then add the ginger garlic paste. Fry for another minute till the raw smell goes and then add the 3/4 of sliced onions. Cook till the onions are translucent. Then add the cilantro and mint and cook for couple of minutes. Then add tomatoes, 1.5 tsps of salt and red chilly powder. Mix well and let it cook till the tomatoes become soft and mushy. 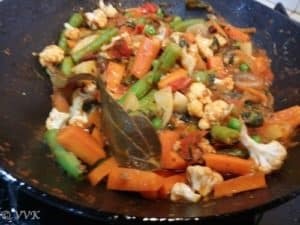 Now add the veggies and cover and cook for 3 to 4 minutes. As we cover and cook, we don’t need to add water. After 4 to 5 minutes add the yogurt and the rose essence and mix well. This mixture doesn’t needs to be very dry. We need it in a semi solid state. In heavy bottom wide pan or vessel just apply some oil. First spread a layer of quinoa and then veggie mixture. 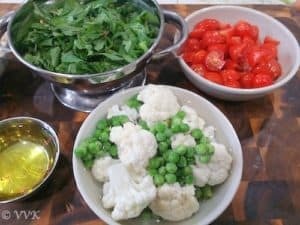 Repeat this for the remaining quinoa and veggie mixture. 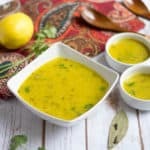 Now drizzle the saffron water all over and cover it completely (Ensure no steam goes away) cook in low flame for 12 minutes. 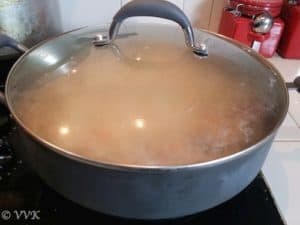 Turn off the heat after 12 minutes and remove the lid and let it rest for 5 minutes. Slow mix the layers and that’s it. 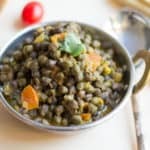 This dum cooking can be done in oven and slow cooker. Of course quinoa can be replace with rice of your choice. Also veggies can be replaced with or you can add mushrooms, soy chunks, broccoli, zucchini etc. 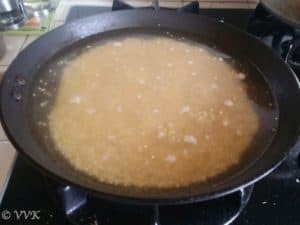 Instead of ghee you can add oil. But ghee adds more flavor. Adjust the green chillies and red chilly powder according to your taste. I am adding salt individually for quinoa and veggies. Dum can be done in oven and slow cooker. 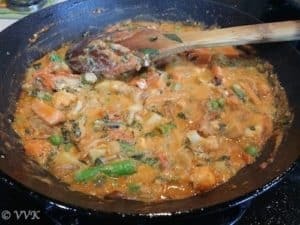 Kalpaasi is not necessary, as I love the flavor I try to add it in all my recipes. 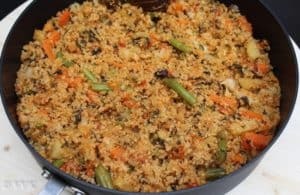 Tamil Nadu Style Vegetable Dum Biryani prepared with quinoa instead of rice and slow cooked again to enhance the flavors. 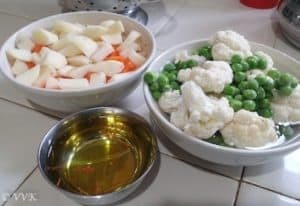 I used 1 potato 1 carrot, 5 to 6 string beans, 1/4 cup of peas and 1/2 cup of cauliflower florets. Boil 3 cups of water with 1 tsp of salt and 1 tsp of oil. Once the water starts to boil, add the washed quinoa and let it cook. Cook till the onions are translucent. Dum can kept in oven or slow cooker. 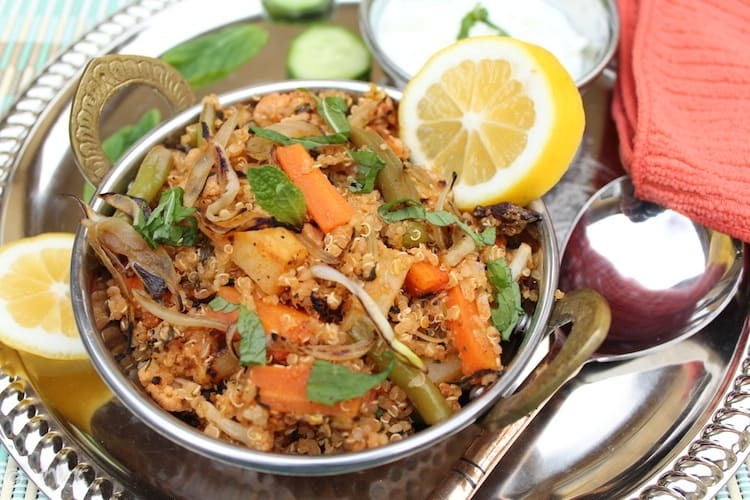 Omg that is one delicious and flavorful biryani with quinoa. Quinoa rules the day for Q!! I made quinoa dish too :) Your Biryani looks amazing Srividhya!! Perfect pick for Q!! I LOVE biryanis and this Tamil Nadu style biryani is calling my name. Will definitely try it out. Love the use of quinoa in here. 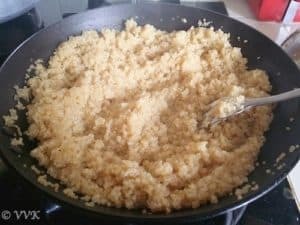 Quinoa – the star ingredient for the day! Love this biryani with so many flavors in there! Am in love with this healthy briyani, my mouth is just watering here..
Biryani looks flavorful and it’s healthy too. Quinoa did rule the day!! Yup yup :-) Thanks Amara. 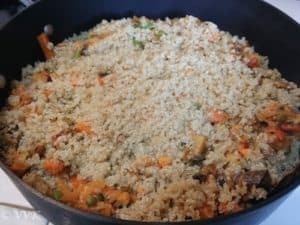 Quinoa veg biryani romba super, i usallly use my rice cooker to cook quinoa, you stove top version has yielded good fluffy quinoa. Love it! Biryani with broken wheat sounds interesting. Will try it out. Thanks Bharani. 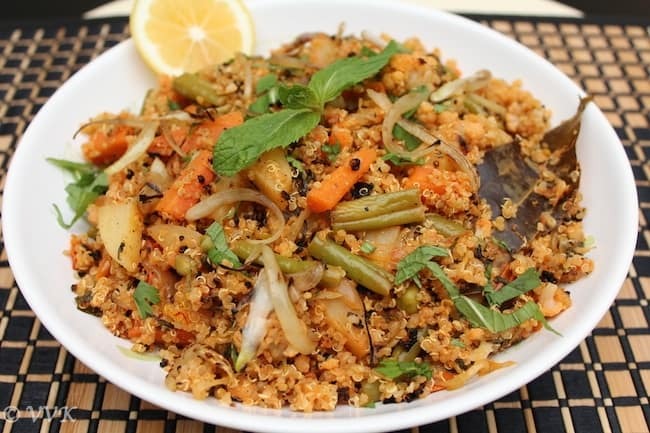 Quinoa in biryani sounds interesting and super delicious. Loved it! Seels like quinoa ruled the day and loved your fusion dish choice using quinoa. It is definitely healthier over the traditional rice version. Thanks a lot Suma. Yeah quinoa is the king today. Quinoa is everywhere today! This looks amazing, and it doesn’t have cumin or turmeric in it, which means I could actually try it out! Thanks for sharing it. I know. :-) :-) Thanks a lot and welcome to my space. Oh my so many quinoa dishes…wow.. It is raining quinoa dishes today. Your dum biryani with quinoa looks perfect with onion raitha..
oh yeah very true. 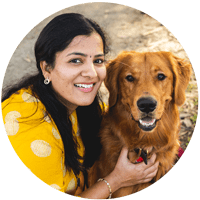 Thanks Gayathri. Quinoa ruled the day!!! 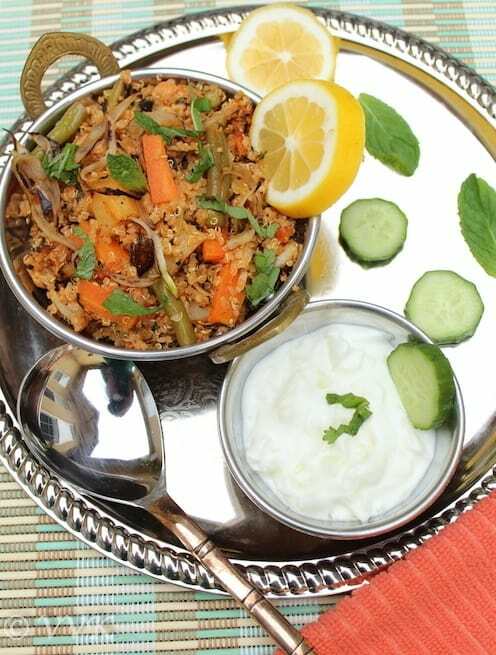 Biryani looks flavorful and great sunstitue for rice. ?? he he yeah.. thanks usha. Then I surely would have to try it out. Have rose essence too! :-) :-) Let me know how it turned out. I just added a few drops.